Dollie & Me Matching Girl & Doll Outfits Sale! If your daughter has an American Girl doll, make sure you check out this Dollie & Me sale! You can get matching girl and doll outfits for as low as $15.99 shipped! Choose from dresses, PJs, and more! 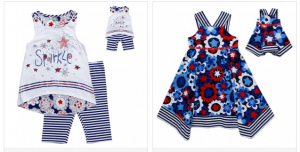 They’ve got some super cute outfits that would be perfect for 4th of July! They’ve got lots of other great deals, too! Get FREE SHIPPING if you just registered with Totsy and make a purchase within 30 days. Shipping is also free when you spend $75 or more. $40 Dashing Pearl Credit for $20: save 50% on personalized jewelry for Mother’s Day! If you’re looking for Mother’s Day gift ideas, this is PERFECT Grab a $40 Dashing Pearl credit for just $20! 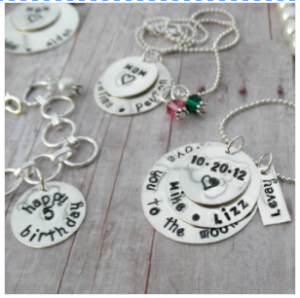 They’ve got super cute necklaces that you can personalize with names and a birthstone! It would be great for grandmas! You can also score great deals on dresses, sandals, and more! Get FREE SHIPPING if you just registered with Totsy and make a purchase within 30 days. If you’re not a first time customer, shipping is also free when you spend $75 or more. Girls Fashion Sandals as low as $5.99 shipped! Totsy is having a sale on girls sandals! Get Girls Fashion sandals as low as $5.99 shipped! They’ve got lots of great styles to choose from! Carter’s and Osh Kosh Shoes Sale! If your little ones need new shoes for spring and summer, don’t miss the Carter’s and Osh Kosh Shoes sale! You’ll save up to 50% off retail prices and prices start at just $9.99! They’ve got sneakers, Mary Jane style shoes, water shoes, sandals, and more! Skechers Shoes Sale: up to 50% off! 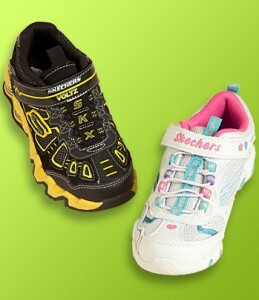 If you or your kids need new shoes, don’t miss this Skechers shoes sale! Save up to 50% off regular retail prices! Prices start at just $25 shipped! There are lots of styles for everyone in the family!